Back in February, patent number 10,198,649 filed with the USPTO gave us a glimpse of what the future may hold for Samsung's Galaxy Note series. Spotted by Patently Mobile, the documents describe what certainly looks like an S Pen – an S Pen with a built-in camera. The patented camera system resides in the upper portion of the stylus. Light enters through a lens placed either on the side of the S Pen or on the top of the stylus, where the clicker is currently found. Moreover, the camera is described as having optical zooming abilities. Cool stuff, right? Now, we're not sure what to make of all this. We don't know if Samsung is trying to eliminate the need for a hole in the display of the next Galaxy Note phone by moving its selfie camera to the S Pen, or if this is being imagined as an additional camera with a powerful zoom lens – the kind of lens that would otherwise be too large to fit inside the phone. But in any case, having a camera in the Galaxy Note's S Pen makes little sense right now, and it isn't a possibility one should be excited about. Here's why. We're not saying that Samsung is incapable of putting a camera inside a stylus. A company of Samsung's proportions is most certainly capable of putting a camera on practically any gadget. But there's a problem: the Galaxy Note S Pen isn't big enough to fit a camera that's actually good. The S Pen shipping with the Galaxy Note 9 measures 5.7 by 4.35 millimeters in thickness. By comparison, the smallest camera module in the Galaxy S10, its 10MP selfie shooter, measures roughly 8.7 by 8.7 millimeters, together with all the necessary lenses and its metal housing. There's no way it can possibly fit inside an S Pen as big as the Note 9's. 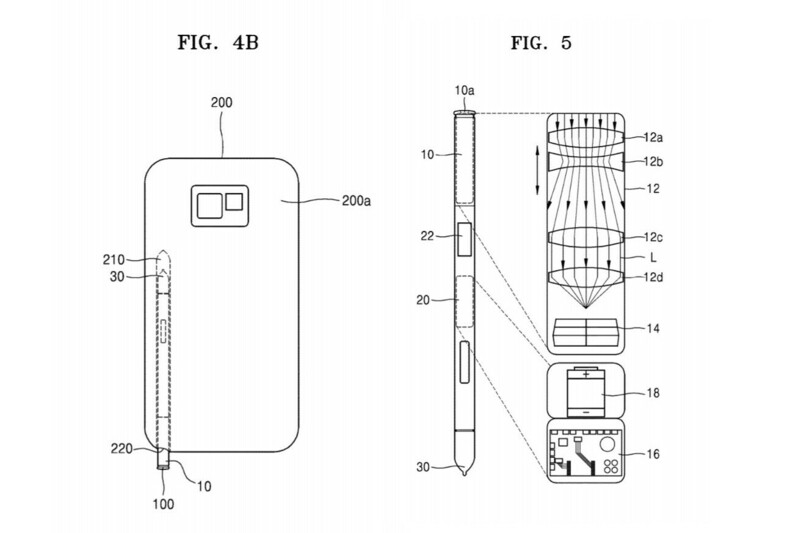 But let's imagine that Samsung makes the Galaxy S10 S Pen a bit bigger and/or equips its stylus with a super-tiny camera – something based around its new ISOCELL Slim 3T2 sensor, for example. This sensor measures only 5.1 millimeters in diagonal, and even when you throw all the necessary lenses and circuitry into the equation, its camera module might still be small enough to fit inside a stylus. That would be a problem solved, right? Well, not really. The camera inside the S Pen would still have to communicate with the Note 10 somehow, most likely in a wireless fashion. The communication would have to involve not only sending visual data to the phone in real time so that you see your subject in the viewfinder, but also transferring the captured image so that it is saved in the phone's memory. Bluetooth would be too slow for the purpose. Wi-Fi Direct, which is used in modern digital cameras, may introduce latency, making the feed appear delayed. And other types of high-speed wireless communication, such as what we've seen in the Essential Phone with its 360-degree camera and in the LG V50 with its Dual Display accessory, works over very, very short distances. But again, let's assume that Samsung has the wireless connection issue already figured out. It is 2019, after all, and advancements in technology never stop. Unfortunately, keeping the S Pen charged would still be a major challenge. Instead of a battery, the S Pen with the Galaxy Note 9 uses a supercapacitor. This is an energy storage device that charges rapidly and has a much longer lifespan compared to a typical lithium-ion cell. However, it can hold only a small fraction of the charge a battery of equivalent size would. Its reserve is sufficient for powering the S Pen's Bluetooth radio for 30 minutes or through 200 clicks of its button, whichever comes first, but that's far from enough energy to power a camera and a faster-than-Bluetooth wireless connection. To have a usable camera in the S Pen, Samsung would need to use a fairly big battery instead of a supercapacitor. There simply won't be a way around this. However, a battery would recharge more slowly and would show signs of degradation in about a couple of years of use, if not sooner – not something you want in a device not meant to be serviced. At this point – and given the evidence in the patent mentioned above – it is hard to imagine a camera in the S Pen being practical. But there's still a way Samsung may be able to pull this one off. Perhaps this wouldn't be a camera you're meant to take out and wave around. 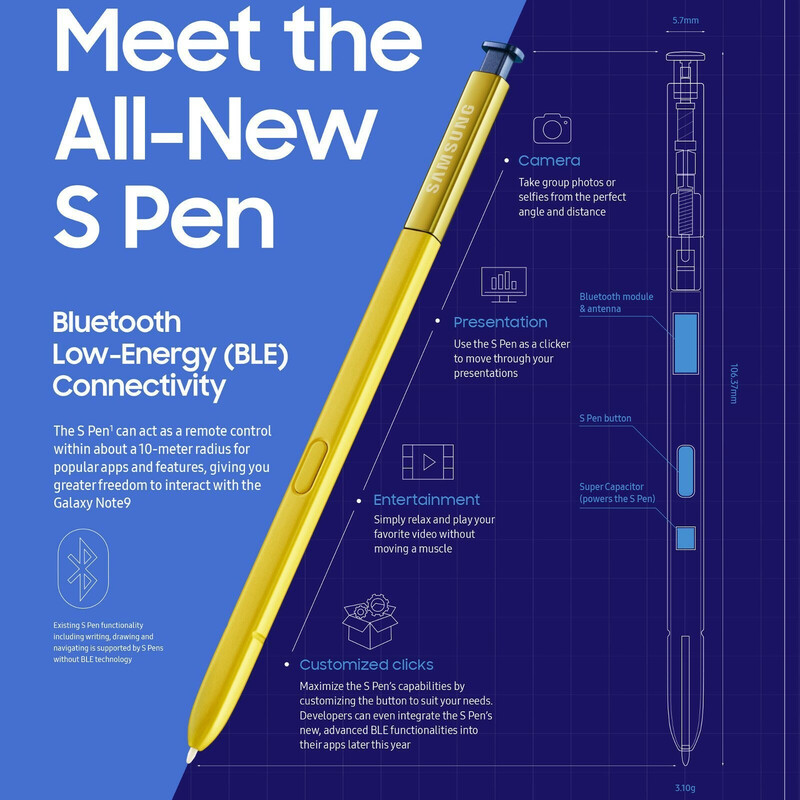 Perhaps the S Pen would act as a pop-up camera and snap out in place when it is needed, while the power and data connections are handled reliably through metal pin connectors. It does sound like a crazy concept, but it just might be crazy enough to work. Still, we think that the chances of seeing a camera in the Galaxy Note 10 S Pen are slim. We're not trying to spoil the excitement around the next big Galaxy. Rather, we want to help everyone set their Galaxy Note 10 expectations straight, because right now, technology may not have advanced enough to allow Samsung to fit a good, easy-to-use camera inside an S Pen of its current size. We hope Samsung proves us wrong this coming fall. just bring that graphite battery out! Let the engineers figure it out. Yeah, agreed. And also for video chats, they'll have to put the s-pen slot at the top. So we can partially slide it out. I'd say S-Pen camera makes more sense as an addition to regular front facing camera, not a replacement. We'll see. This article makes little sense. Here's why: 1. You don't work for Samsung. 2. You're not experienced in designing/engineering phones/accessories. 3. You have no idea why they want a camera inside the S-Pen. 4. What doesn't make sense to you still makes sense to others. 5. The S-Pen will still have a camera whether this article exists or not. ^ This Note 10 is looking to be an amazing device. Cant wait.. Hype & rumors are 2 different things. Agreed. What is very useful though is the ability of the pen to initiate a shot when you leave your Note 9 on a stand. It is much better than a timer. Please bring all that innovation to the note 10! Hell no I want to see innovation. Gets rid of the hole punch in doing so. Of course it doesn't make sence to you, Apple didn't do it so, in PAs eyes it makes no sence. If Apple was doing it , it would be the beat thing ever. If this is true Samsung just shows once again how innovative they are. If you put a second-generation scanner in Note 10 and an improved processor, you can replace Note 8 in Note 9. But I think the size of the smartphone should be the same. 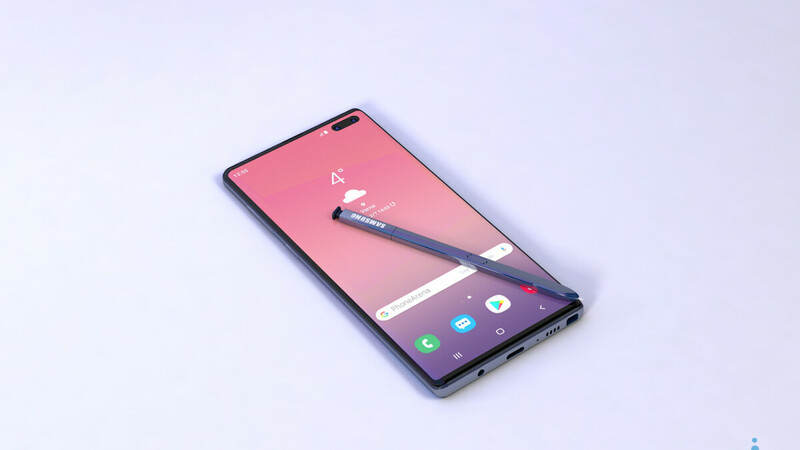 It makes a lot of sense to me, just move the s-pen to the top with 2 step to eject (1 push for selfie camera) and (2 push to take the pen out) and you will have a true bezel less phone. Bring it Samsung! or we stop being obsessed with selfies and remove the camera.